The St Vincent de Paul Society opposes cuts to penalty rates, which are an essential buffer against poverty and are relied on by people battling to make ends meet. Working on nights and weekends can have a detrimental impact on health, family and personal relationships and should be fairly compensated. Vinnies believes everyone has a right to decent, just and dignifying work, and that penalty rates are a vital element in a fair and just employment system. Read our media release 'Vinnies deeply saddened by penalty rates decision' and a summary of media clips quoting the Society's National CEO, Dr John Falzon. Penalty rates are an integral part of Australia’s industrial relations system and have been so for over 100 years. They stem from a longstanding understanding that weekends and time with family, friends and community is valuable, and that those who miss that time due to work should be compensated. Penalty rates provide a basic premium for being at work during times when other people get to relax or spend time together – on weekends, public holidays, and at night. For many, that compensation helps to make ends meet. What changes are being made to penalty rates? On 23 February 2017, the Fair Work Commission announced that Sunday and public holiday penalty rates will be reduced for workers in the hospitality, retail, pharmacy, and fast-food industries. 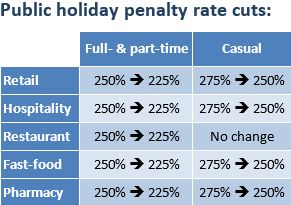 Employees in the restaurant industry will also see their public holiday penalty rates reduced. The reduced rates are to be phased in over several years, with reductions implemented on July 1 each year until the transition is completed by 2019 or 2020. The loss in earnings varies by industry and type of employment. In retail, the reduction in penalty rates could result in a loss of $72 from a seven-hour Sunday shift. For a young person experiencing housing stress, such a loss in earnings could tip them out onto the street. Who will be affected by penalty rate cuts? The changes to penalty rates could affect up to 700,000 workers across the retail, hospitality, fast-food and pharmacy industries. These industries have the largest proportions of low-paid, award reliant workers. Employees who rely on penalty rates to meet their household expenditure are far more likely to be a single parent, a woman, a young person, in receipt of a household income less than $30,000, and/or living in regional Australia. While a third of Australians rely on regular Sunday shifts as a part of their wage, nearly 40% of young people rely on penalty rates to survive. For many of these young people, working on Sundays is a necessity, not a matter of lifestyle. Sunday penalty rates help to make up for earnings that they don't receive when they are studying, doing care work or aren't rostered on enough as casuals. Recent studies have shown that young people are increasingly experiencing a compromised work-life balance and significant cost-of-living pressures. They are already facing unaffordable housing, insecure work, reduced access to social security, and low levels of student assistance. Student poverty has increased over the past decade, with nearly two-thirds of university students living below the poverty line. Cutting penalty rates will only compound these pressures. Cuts to penalty rates will disproportionately affect women and will increase the gender pay gap. While they make up less than half of the total Australian workforce, women make up the majority of workers in the sectors affected by the penalty rates decision. Women in these industries are also more likely to receive minimum award wages. They are more likely to rely on penalty rates to meet household expenses, and more likely to work part-time or on a casual basis compared to their male counterparts. For women with caring responsibilities, working on weekends may be their only option given limited workplace flexibilities and a shortage of affordable childcare. The gender pay gap in Australia remains stubbornly high, with women in full-time employment earning 16% less than their male counterparts. 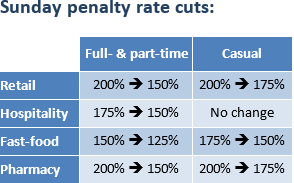 Cuts to penalty rates risk widening this gap. Cuts to penalty rates will inflict a heavy burden on rural and regional communities. These communities already lag behind their metropolitan counterparts on a variety of socio-economic measures, including income. Workers in these areas are also more likely to be employed in the retail and hospitality industries. Modelling undertaken by the McKell Institute shows that any reduction in penalty rates is likely to result in a substantial decline in regional and rural economies, where nearly one in five workers are employed in the hospitality or retail sectors. In addition to slashing a combined total of $667 million from the take-home pay of all the workers affected by penalty rate changes, the modelling shows the flow-on effects for regional communities will be substantial. The reduction in worker’s disposable income will result in less being spent in local businesses, while at the same time an estimated $289.5 million will be shifted out of regional economies as non-locally owned businesses shift the savings from labour costs elsewhere. This will hurt small and locally owned businesses, slow jobs growth in regions that are in many cases already struggling with high unemployment, and compound the disadvantages already experienced in regional Australia. Why does Vinnies oppose cuts to penalty rates? For many low-paid workers, Sunday penalty rates are a vital safety net and buffer against poverty. Any reduction of penalty rates will have a major and potentially devastating impact on many low-paid workers and their families, many of whom already struggle to make ends meet. Many workers on penalty rates are among the lowest paid. According to the Australian Work and Life Index, 37.8% of workers who work weekends only and receive penalty rates rely on these to meet household expenses. This increases to 48.8% for those working both evenings and weekends, and 52.2% for Sundays only. The Fair Work Commission itself acknowledged that ‘many of these employees earned just enough to cover weekly living expenses’ – yet they are the very people the Fair Work Commission have targeted for cuts to penalty rates. Poverty is rising among low-paid workers. More than one in three (34.6%) people who experience poverty live in a household with at least one full-time or part-time worker. Over the past decade, workers reliant on minimum wages have seen their income slipping further behind average weekly earnings and, for some, below the poverty line. This trend is reflected in the growing numbers of ‘working poor’ who seek assistance and support from charities such as Vinnies. These are people who are holding down jobs but not earning enough to make ends meet. Cutting penalty rates will only further erode the social safety net in Australia, entrenching poverty and punishing some of Australia’s most vulnerable workers. Working weekends, evenings and public holidays means regularly missing out on time with partners, children, grandchildren and friends. It often means being absent for family celebrations, important milestones, social activities and community events. Some employer groups have argued that we now live in a 24/7 economy, and that the distinction between working on Sunday’s or public holidays is irrelevant. Vinnies rejects this argument. The overwhelming majority of people still work standard working weeks and require weekends to rest, socialise, play and worship. There is ample evidence showing that working on weekends compromises these non-work activities, reduces quality of life, reduces time with family, interferes with work-life balance, and impacts on workers’ overall health. Surveys suggest that most Australians continue to see Sunday as a day reserved for rest or family and social time. An Essential Media Poll in 2015 found that 81% of people surveyed believe that those working irregular hours should receive penalty rates. A further 70% opposed cutting weekend and public holiday penalty rates. Will cutting penalty rates create more jobs? There is no reliable evidence supporting the proposition that reducing penalty rates will boost the economy and create jobs. Even the Productivity Commission has conceded that there are ‘several deficiencies’ in the evidence for cutting penalty rates, and that ‘robust evidence’ in favour of lower penalty rates is ‘hard to find’. The notion that reducing penalty rates will create more jobs is not based on empirical evidence, but relies on discredited ‘trickle-down’ economics which assumes the benefits will flow onto workers in the form of more jobs, as opposed to just increasing profit margins and inequality. Evidence suggests that such ‘trickle down’ benefits are unlikely. Measuring the effect of penalty rates on employment levels is difficult given the challenges of disentangling employment effects from wider economic conditions or general workforce changes. 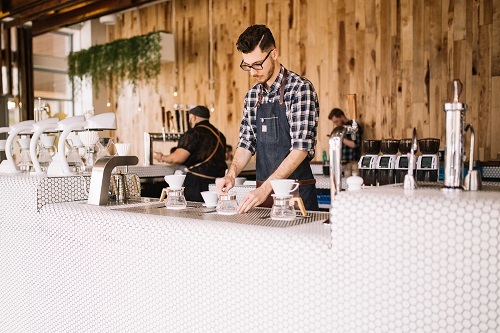 However, one Australian study analysed the effects of differing penalty rates over a five-year period under the previous state-based industry awards system. This study found that higher penalty rates did not lead to lower levels of employment – there was, in other words, no increase in the number of jobs when penalty rates were reduced. There was, however, a small difference in the hours worked, with employees on lower penalty rates working longer hours. Based on this study, the only likely impact of reducing penalty rates is that employees will work for longer hours for lower earnings, with little or no improvement in the number of jobs.